Documentation: Photograph: 11-15 Nov 2001 Lexington, Dawson Co (Jorgensen 2003). 16 Sep-second week Oct 2010 photographed Gretna, Sarpy Co (Brogie 2017). Comments: There are eight records for Colorado (CBRC 2017), four for Kansas (Thompson et al 2011), but none for South Dakota (Tallman et al 2002), Iowa (Iowa Ornithologists’ Union 2017), or Wyoming (Faulkner 2010). Of these 15 records for Kansas, Colorado, and Nebraska, 12 have occurred since 2000 and are scattered from May-Dec. Baltosser and Scott (1996) stated that “Since 1970, impressive record of vagrancy and sporadic occurrences in Pacific Northwest. … Fewer records of stray birds east of Arizona–New Mexico border than in Pacific Northwest.” Williamson (2001) commented “Much of its life remains a mystery, particularly its travels during the non-breeding season”. 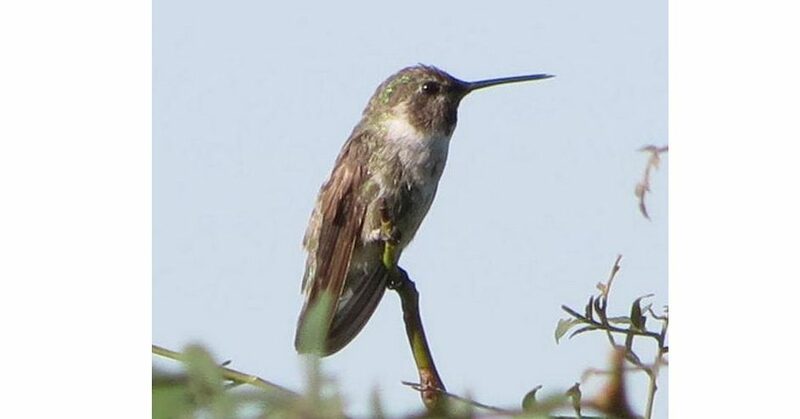 Photograph (top) of an immature male Costa’s Hummingbird at Lake McConaughy, Keith Co 7 Sep 2013 by Kathy DeLara. Colorado Bird Records Committee [CBRC]. 2017. Costa Hummingbird records. Colorado Bird Records Committee database, accessed 18 February 2018. Iowa Ornithologists’ Union. 2017. Costa’s Hummingbird records. Iowa Records Committee reports of Iowa rare bird records, accessed 21 February 2018.